The distinctive Borzoi or Russian Wolfhound, originally bred by nobility, has a long silky coat and stands with a graceful posture. The Borzoi or Russian Wolfhound are sweet, loyal dogs. They can get along well with children but don't like rough play. They rarely bark, are very intelligent, and are somewhat easier to train than most other hound breeds. These dogs have few hereditary problems and are usually healthy overall. But when choosing a Borzoi, look for signs of eye problems and hip and elbow dysplasia. Breed Type The Borzoi is a hound breed. A member of the sighthound family, the Borzoi is a skilled hunter. This breed is accustomed to cool climates. Background The Borzoi's history is somewhat uncertain, but it was brought to Russia in the mid-1600s. There it was bred by nobility, who crossed it with the Russian Laika to give it a longer, thicker coat. The breed was so prized that its sale was not allowed for centuries. The only way to obtain one was to receive it as a gift from the Tsar. 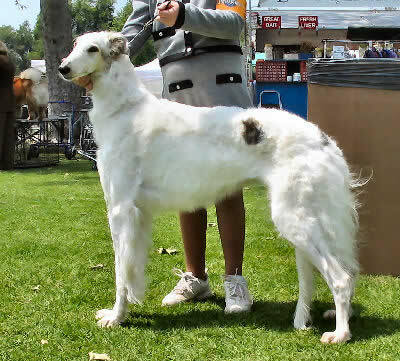 Description The Borzoi has a very distinct look, with its graceful posture and its long, silky coat. Its muzzle has a slight arch, and its ears lie back on its neck. The back is also slightly curved, as is its long tail. Coloring may be white, golden, tan, or gray with black markings, and the dog may be solid colored or mixed. Male Borzoi are at least 28 inches tall and weigh 75-105 pounds. Females are at least 26 inches tall and 60-90 pounds. Care and Feeding Borzoi need plenty of fiber, the best sources of which are wheat and yellow corn. Beef and horse meat are the best proteins for this breed. Borzoi should have two or three small meals each day, and should be allowed to rest for several hours after eating to prevent bloat. The Borzoi requires regular brushing, and the hair between its toes should be clipped periodically. Hind dewclaws are usually removed shortly after birth, and fore dewclaws may or may not be removed. Dry shampoo is usually sufficient for cleaning. The Borzoi sheds heavily at times, so frequent vacuuming is required if it is to be kept indoors. This breed does a good job of keeping itself clean. Housing Your Dog The Borzoi can live indoors or outdoors. These dogs are not terribly active indoors, but they need adequate space to run when outside. The Borzoi's thick coat makes it best suited to cool to moderate climates. Social Behaviors Borzoi get along nicely with humans. They can do well with children, but they do not like rough play. Borzoi get along well with other dogs, but they may chase other pets. Handling and Training The Borzoi is a very intelligent breed, and it does better with obedience training than most hounds. Still, it has a mind of its own, and will often take off after smaller animals. Activities This breed needs plenty of exercise, including a long walk each day. They also need a place where they can run off leash. When your Borzoi is outdoors without a leash, he should be fenced in or carefully supervised. Breeding/Reproduction Finding a quality mate for your Borzoi is important to keep the breed as healthy as possible. Check bloodlines for all potential mates. Borzoi usually have small to medium-sized litters, and it is not unusual for a litter to consist of only one puppy. Common Health Problems Although not very common, some Borzoi suffer from heart problems. A few also suffer from Borzoi Retinopathy. Availability The Borzoi is a rather rare breed, and may be difficult to find locally. Breeders can be located online. Puppies often sell for over $1,000.